As always, April was a busy month. The month started out with our FFA invitational horticulture and floriculture judging contest at SFA. Each competition had several hundred students from schools around the state that entered. It really keeps us hopping for a few days each year. It’s always nice to see former student Boone Holladay and his students there. Boone used to work in my Arcadia garden for me when he was a horticulture student at SFA. That same week I attended the Pineywoods Audubon Society meeting and heard friend and fellow garden writer, Jeff Abt, speak about the late famous Nacogdoches poet, Karle Wilson Baker, and her book The Birds of Tanglewood which she wrote at her home in Nacogdoches. Unfortunately the home is now a fraternity house. Historic Nacogdoches, Inc. is currently raising funds to add her statue to the growing collection in Nacogdoches. Of course I like her bird book because bluebirds were her favorite bird! Though I have an original signed copy (thanks to friend Jeff) it’s recently been reprinted by Texas A&M Press. The first Saturday of the month I did a radio interview with Bexar County horticulturist, David Rodriguez, on WOAI in San Antonio. We talked about my new vegetable book and about my days as county horticulturist there. I used to do a weekly radio program on WOAI with the ever popular Bill McReynolds in the late 1980’s. Then I spoke to a SFA horticulture class on plant breeding and the stories behind my introductions to the Texas nursery industry. I think I overwhelmed them as I mostly got blank stares. The second Saturday of the month I spoke at Arbor Gate with my friend, mentor, and co-author Bill Welch. We had fun yapping as always. I then worked in my little garden at Arbor Gate and planted some more of my plant introductions. Beverly had some very nice signs made that placed in their appropriate spots. While there, friend and Rose Rustler Becky Smith made me a beautiful tile mosaic stepping stone with my Rosie dog’s picture on it. I put it next to her grave under my weeping baldcypress. I also came home with a yellow bird of paradise (Caesalpinia gilliesii) which I have been seeking for years now. It’s very showy and drought tolerant. It used to be Marie Daly’s pride and joy when I was her yard boy growing up in Longview. I’ll plant it at my great grandparent’s dogtrot just up the road inside an old wagon wheel ring where I grow my bluebonnets each year. The next day I did a radio interview with my buddies Jerry Parsons and Calvin Finch on KLUP in San Antonio. We mostly hooted and hollered but occasionally talked about my new veggie book. Calvin was the county horticulturist in San Antonio after I left. Of course Jerry was the long time vegetable specialist there and tutored us all. I dedicated the book to Jerry and his late predecessor in San Antonio, Sam Cotner. 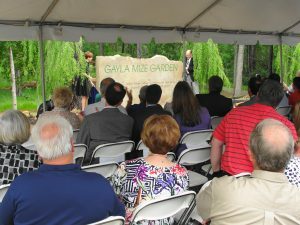 On the following day, April 16, we dedicated our new Gayla Mize Garden at SFA. It will feature many cultivars of both deciduous and evergreen azaleas, as well as Dave Creech’s usual incredible assortment of rare woody ornamentals. Gayla Mize was a good friend of both historic Nacogdoches and SFA Gardens. She even took one of my horticulture classes years ago. Her husband Ray made the garden possible with a generous gift. 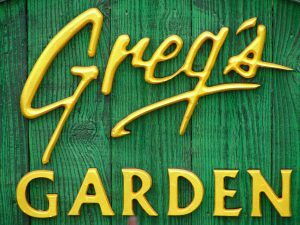 The Gala Mize Garden is directly across from the Ruby M. Mize Azalea Garden on University Drive in Nacogdoches. They are both part of SFA Gardens. Saturday April 21 was our big Garden Gala, plant sale, and Earth Day celebration at SFA Gardens. Our spring and fall plants sales are our major fund raisers for the gardens and part time staff. That includes me! Without these two successful sales I’d be picking up aluminum cans on the roadside full time. 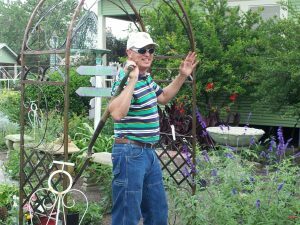 Thanks to the SFA Pineywoods Native Plant Center we always have lots of native plants for sale as well as many of my introductions to complement our usual assortment of Texas tough perennials, tropicals, and woody ornamentals. We grow most of the plants ourselves at SFA, with student and volunteer help of course. I gave a lecture on “Growing Your Own Veggies at Home” at the Earth Day celebration. The following Monday I had to put on clean clothes and do a little TV interview for the SFA campus Purple Pride on SFA Gardens. Of course I yapped on like a ninny but they didn’t seem to mind. The last weekend of the month I attended the annual Briarwood Picnic at the Caroline Dorman Nature Preserve in Saline, Louisiana. I even led an afternoon walking tour. The late Caroline Dorman was a kindred spirit and amazing woman. She was the first female forester in the U.S., the first conservationist in Louisiana, and was pretty much solely responsible for the establishment of the Kisatchie National Forest. She was raised in Arcadia, Louisiana but her people were from around Saline. Around 1950 she built her “dream home” in the woods at Briarwood. 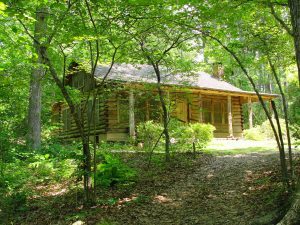 It’s an incredible log cabin tucked in the middle of the woods. She authored a number of books including Wildflowers of Louisiana, Flowers Native to the Deep South, Natives Preferred, Southern Indian Boy, and Bird Talk. Her biography The Gift of the Wild Things has recently been republished and tells the story of her amazing life. In the writing world, I published an article on Turk’s Cap in the May/June issue of Texas Gardener and one on crinums in the May/June issue of Neil Sperry’s Gardens. Next month finds me in Austin on May 3 doing a radio interview with Cecilia Nasti’s Field and Feast program in Austin and in San Antonio speaking to the state Master Gardener conference on May 4. I’ll be rambling on about my grandparents old dogtrot house in Arcadia and my gardens there. I’ll get to see and visit with lots of my old San Antonio friends while I’m there. Our SFA Gardens Lone Star Regional Native Plant Conference will be held in Nacogdoches May 18-19. I’ll be speaking on landscape design. For a brochure and registration form, go to our website at sfagardens.sfasu.edu. On Saturday May 26 I’ll be doing a book signing at King’s Nursery in Tenaha. King’s is a third generation nursery in Shelby County. Aubrey and Cheryl King are good friends of mine. And on May 31 I leave for Richmond, Virginia to attend the annual meeting of the Southern Garden History Society. They have great meetings and even better tours. Join and attend if you can. Their website is southerngardenhistory.org.